A friend gifted me with the Pagan Otherworlds Tarot and Guidebook, believing I’d love this deck, and boy was she right! 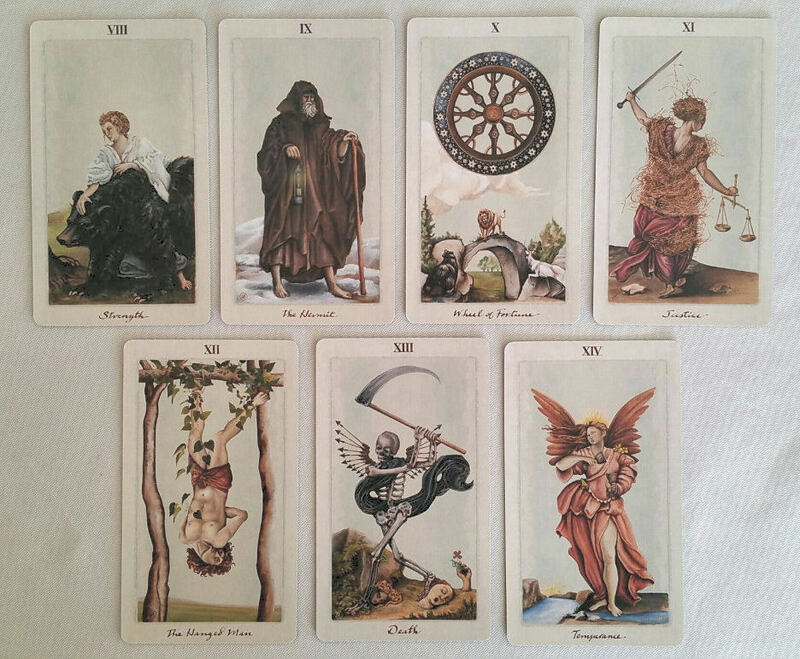 This deck is currently the darling of the tarot community. Everyone is just fawning over and crushing on it. 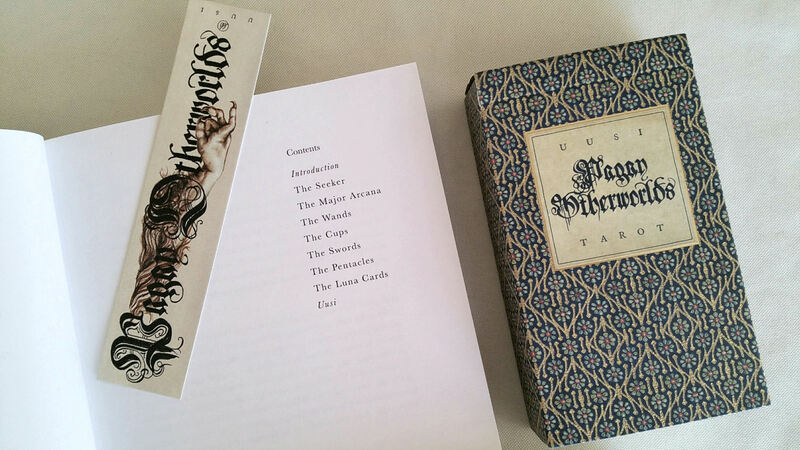 Let’s start with the Guidebook, Tarot: Notes From the Pagan Otherworlds. It’s perfect bound, a beautiful compact square size, and features the Page of Cups. I’m so thrilled to have the companion guidebook. 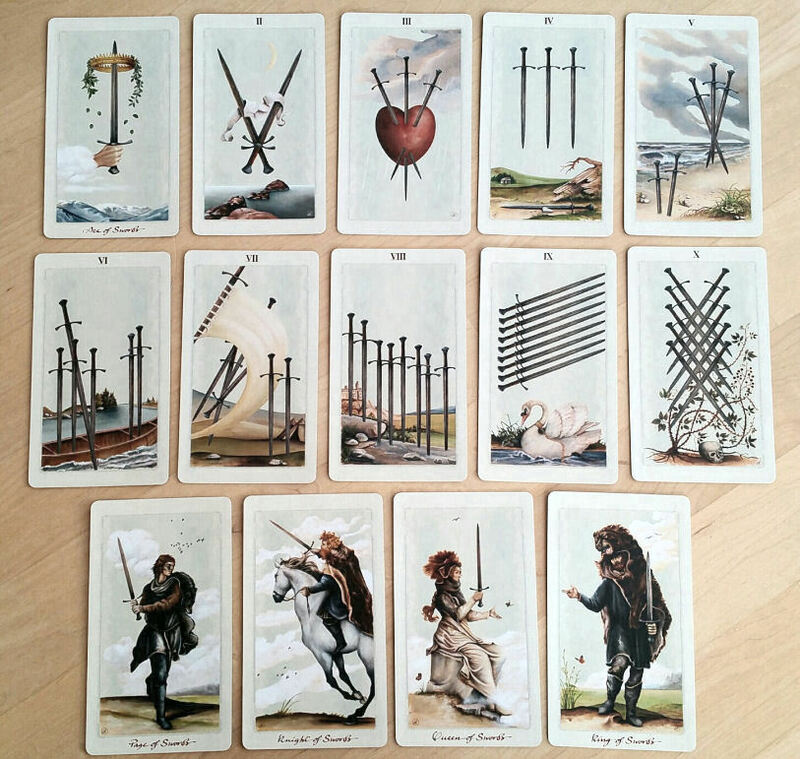 It does an incredible job explaining the deck creators’ rationale for depicting the various cards as they have done, e.g., in this deck, the Nine of Swords is the card of transformation, so on it is depicted a swan, symbolic of the struggle this deck’s Nine of Swords represents–the struggle of coming into your own. This deck’s Nine of Swords is one of the most exquisite Nine of Swords I’ve come across. 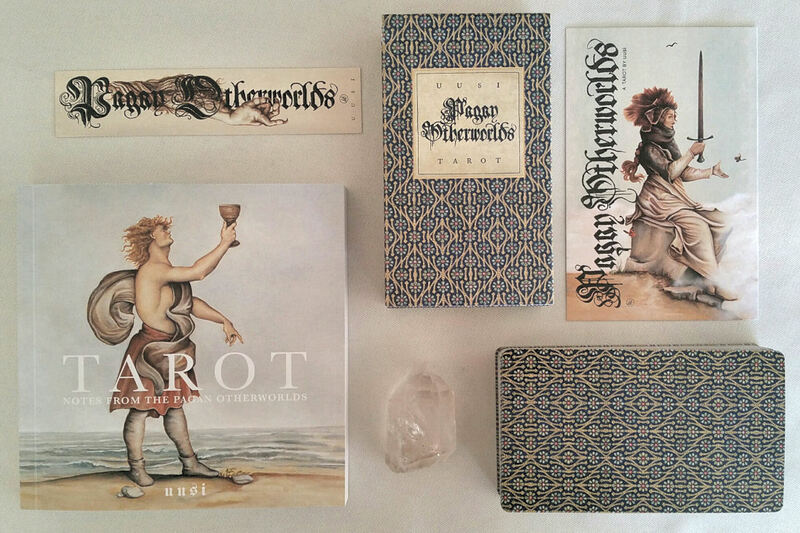 The deck and guidebook together would be an incredible gift and starter tarot kit for someone just learning tarot. 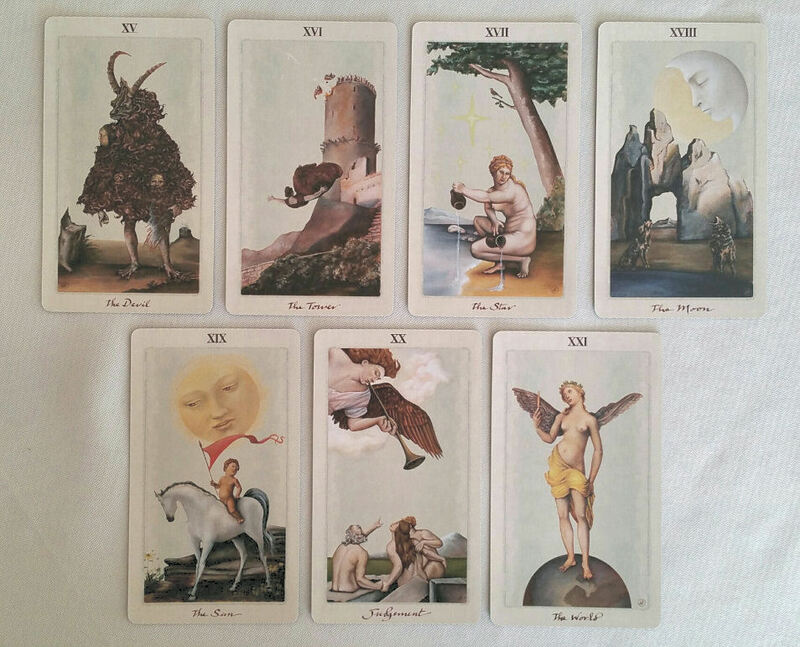 However, the deck is a bit of a mix between the Rider-Waite-Smith structure, placing The Fool first, Key 8 being Strength, and Key 11 being Justice, as you’ll see in subsequent photos in this review, but features unillustrated pips (meaning no narrative imagery on the pip cards), reminiscent of Tarot de Marseille. The Pagan Otherworlds deck features many additional cards, which I love. 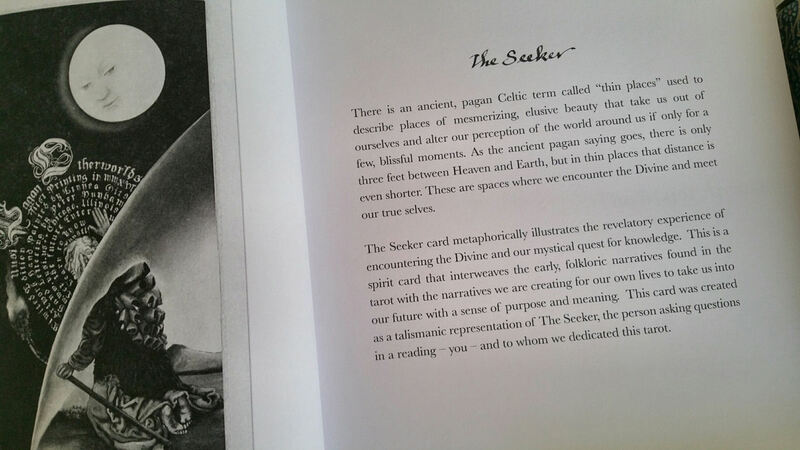 There’s the addition of “The Seeker” card, which would be a really neat card to use as a significator (or signifier) if that is part of a practitioner’s approach to tarot reading. It resolves the issue many have of “removing a card from the deck” when using one of the 78 as the significator. There is also the addition of five cards representing five different phases of the moon cycle. Below, left to right, are: full moon, gibbous, quarter, crescent, and black or new moon. I love how, for instance, the gibbous moon, depending on whether it appears “upright” or “reverse” will determine if it’s a waxing gibbous or waning gibbous; same with the quarter, whether it’s a first quarter or third quarter, and for the crescent, waning crescent or waxing crescent. 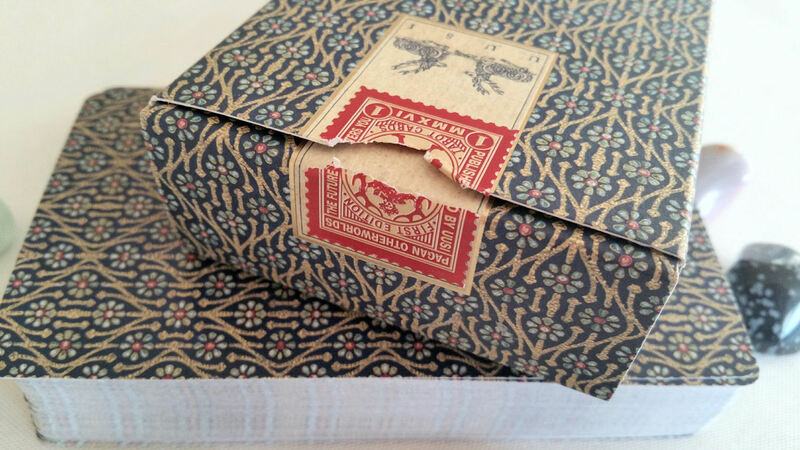 The box and packaging throughout has a Victorian feel and the matte papery box is absolutely beautiful. Now let’s get into the cards. The artwork is inspired by European paganism and you can see iconic imagery throughout the deck that harkens to those roots. As I had noted earlier, the Majors follow the RWS order system with Key 8 as Strength and Key 11 as Justice. I love that Wheel of Fortune card, by the way. You also see a lot of Tarot de Marseille influence in the Majors here, e.g., the Death card. For my in-person professional tarot readings as of late, I’ve been using both a full tarot deck with the 78 cards, often in the Rider-Waite-Smith tradition, plus keeping a 22 Majors-only deck to the side, to pull in on a case by case basis, depending on the client’s questions. Sometimes clients ask some of the “bigger questions,” where a Majors only deck is better suited for addressing those inquiries. Or after drawing the standard deck into a spread, I might pull additional cards from the Majors only to pinpoint overarching themes that tie the various cards in the spread together. 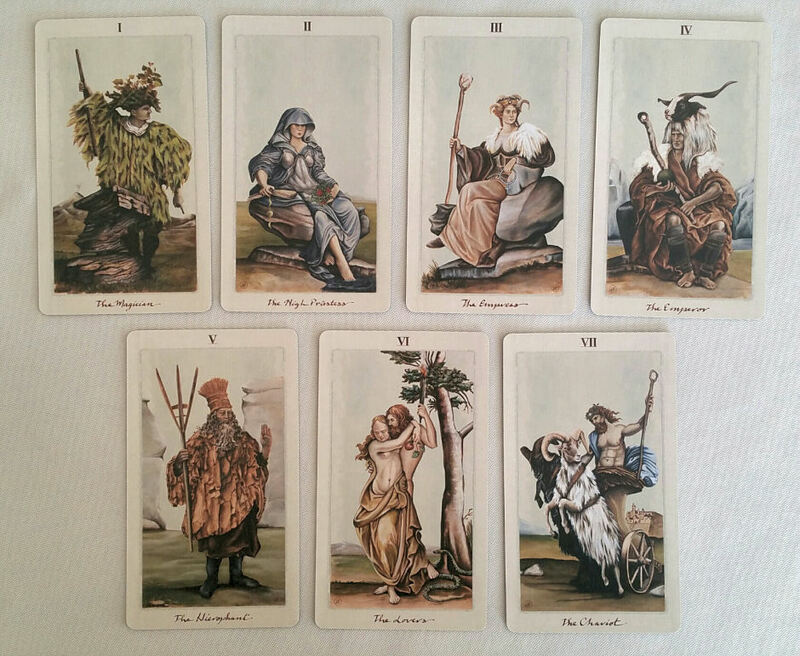 In those instances, right now I like to pull out the Majors only from the Pagan Otherworlds deck. 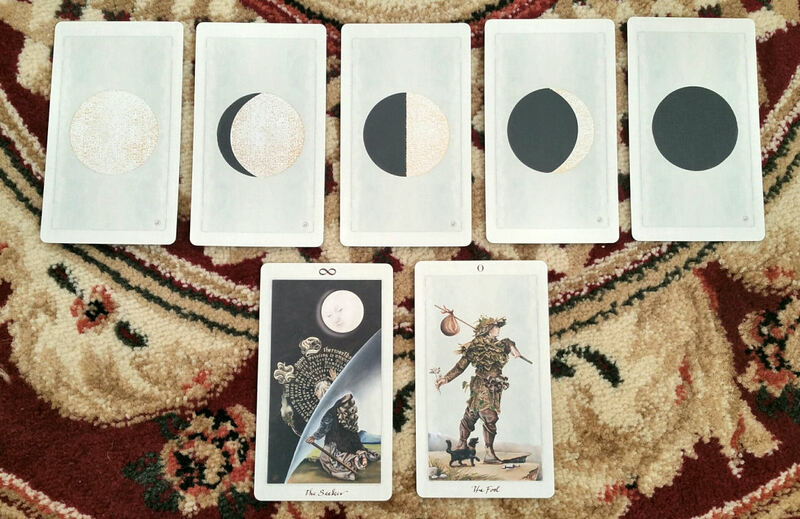 I’ll also use the moon phases cards in readings for assistance with timing issues. Here you’ll see what I meant by unillustrated pips. 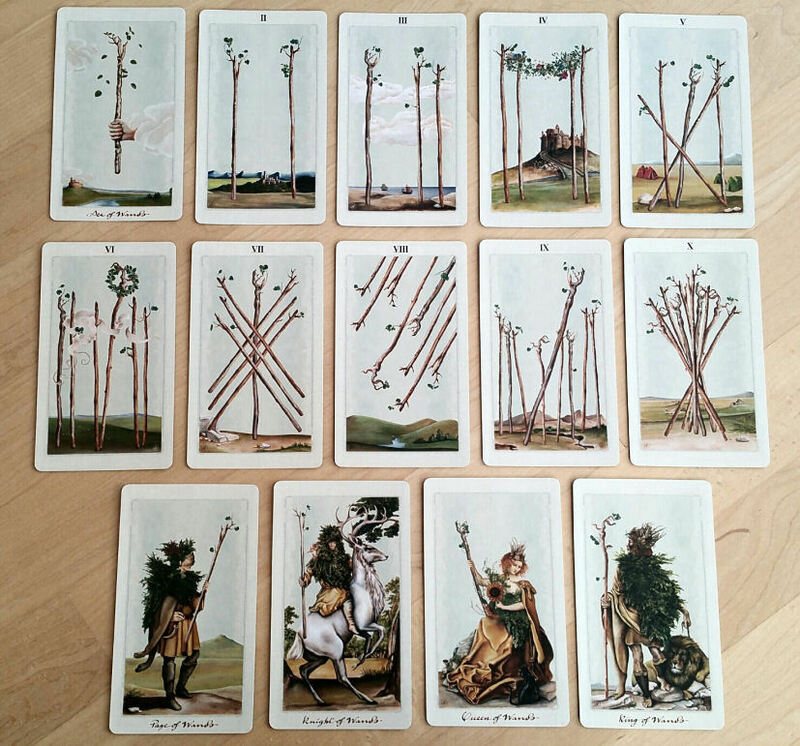 Nonetheless, there’s strong Rider-Waite-Smith influence even here, as you’ll see in the Four of Wands above, the victory wreath in the Six of Wands, and the arrangement of the staves in the Eight of Wands and Ten of Wands. All of these pips, actually, are reminiscent of the imagery on the standard RWS. So it’s an easy deck for any RWS or TdM reader to pick up. 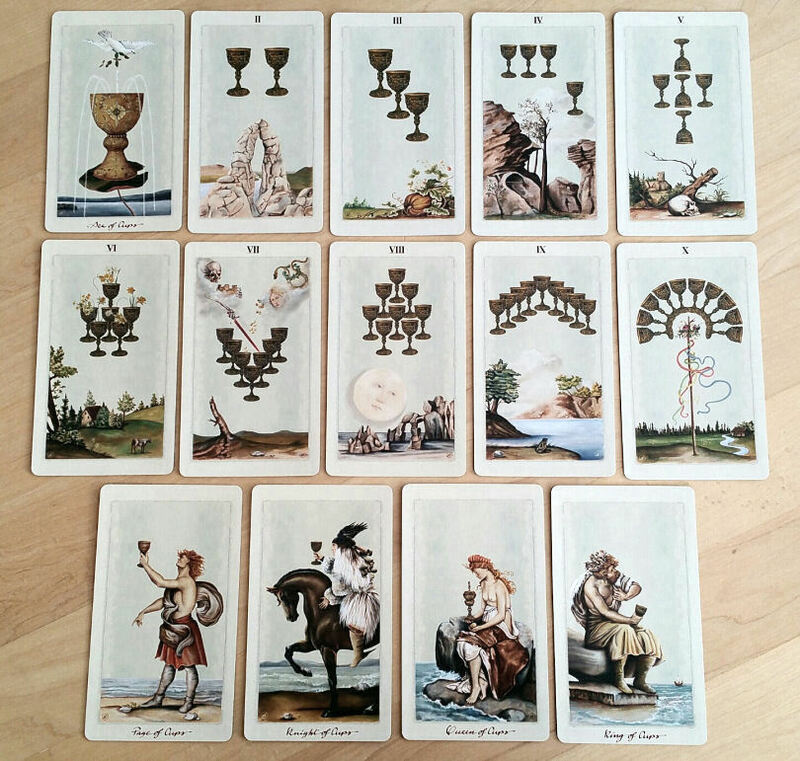 Again, here with the suit of Cups, even though there isn’t the full detailing of narratives as you might find in RWS-inspired decks, we see that the arrangement of cups in each card is reminiscent of the RWS scenes. Note the Two of Cups, or the Four of Cups, how one goblet is off to one side, the Nine of Cups, or even the arrangement in the Ten of Cups. Love the maypole in the Ten of Cups for symbolizing that sense of familial happiness, spiritual fulfillment, and cheer. I had wondered whether the four suits would correspond with the equinoxes and solstices, as would have been celebrated meaningfully in pagan traditions, given that this is the Pagan Otherworlds deck. If so, then the spring equinox or Ostara, would have been expressed in the suit of Wands; the summer solstice or Litha in the suit of Cups, here in the suit of Swords, pictured above, might be delineation of the autumnal equinox, and below, in the suit of Pentacles, Yule. Perhaps someone more knowledgeable than me in the pagan Wheel of the Year could confirm here. 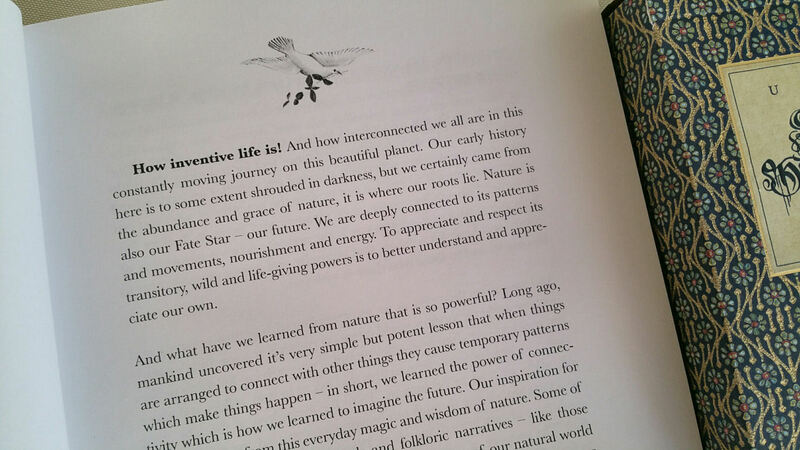 As a professional reading deck, Pagan Otherworlds is just exquisite. I love the white borders, subtle white-toned background, and the dramatic contrast between the bold coloring of the foreground imagery and the white backdrop. I love the Victorian art aesthetic. I’ve done many of my tarot readings with the Pagan Otherworlds deck and reading with this deck is seamless, effortless, and inspiring. 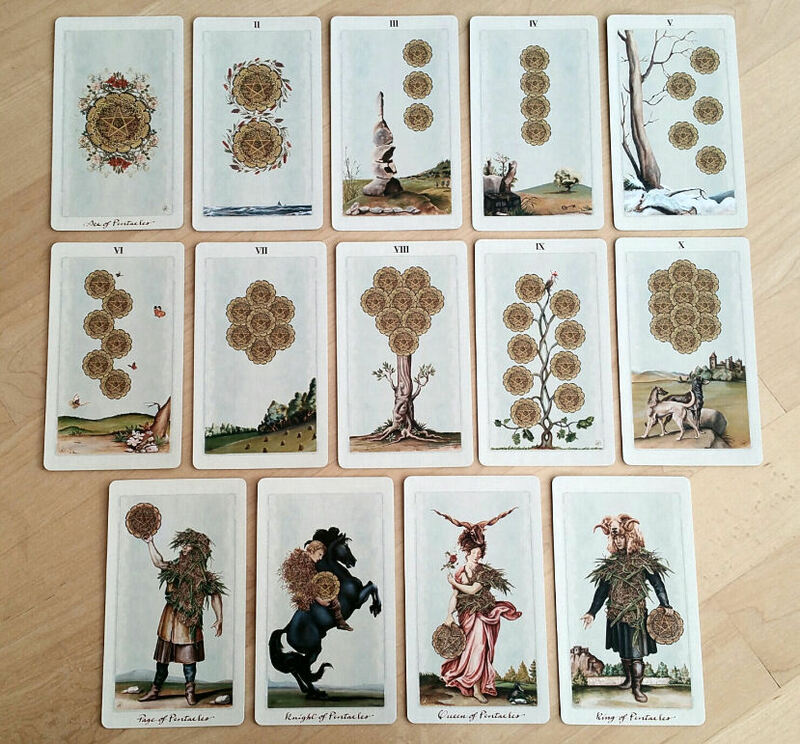 Above is a snapshot of how I’d work with the deck in a twelve-month forecast, each card representing a different month, and the four tripartite rows representing each of the fiscal quarters and four seasons. Using the Pagan Otherworlds deck, what have I to prognosticate for the United States overall in 2017? 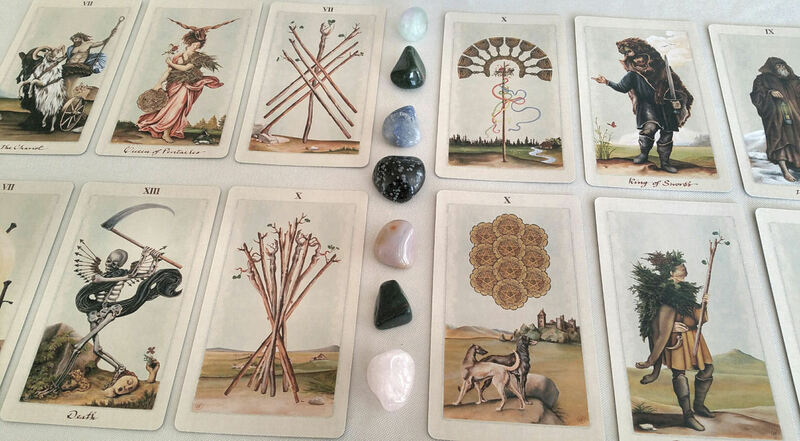 Six of Wands here suggests to me positive measures toward job creation. That and the Temperance card here assures me our economy will do well. National healthcare, expressed there in the Eight of Swords, to put it bluntly, doesn’t look so good. 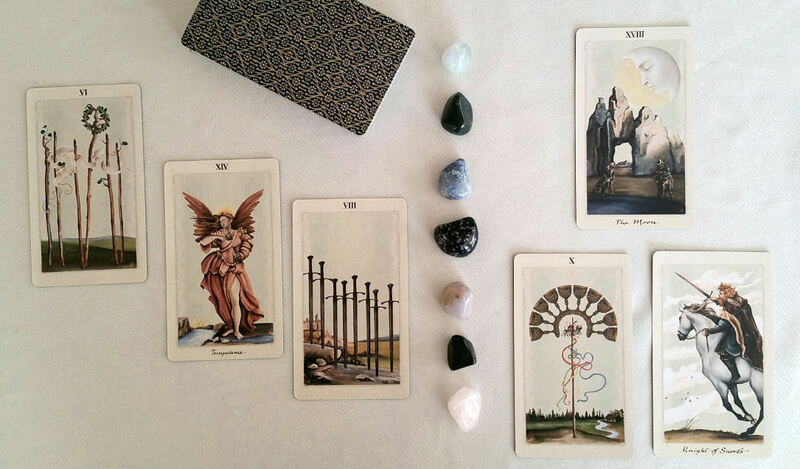 How tarot readers interpret The Moon card depends on their personal experiences, I suppose. For me, it’s not positive. Here, we see social unrest, uncertainties in the social justice system, and major changes to come in the civil sector, not all of them toward the better. Yet overall, unlike many of the like-minded kindred spirits I share political views with, I am optimistic about America’s future. The Ten of Cups shows me that in the grander scheme, it’s still going to be a great year for many Americans. Finally, as for our spirituality as a nation, we need to be more mindful of international relations, as what most affects our karma as a nation is going to be in how interactions with other nations, other cultures, and global trade. 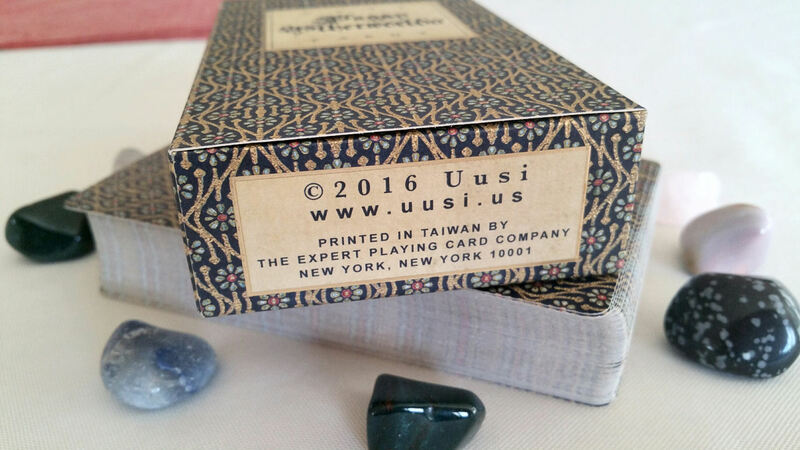 By the way, how excited was I when I found out Uusi produces the Pagan Otherworlds deck in Taiwan! That’s awesome! I am so in love with this deck and was so happy to receive it as a gift this past winter holiday season. I love Uusi decks. I have several other decks from this publisher and every single one has been incredible in its production value. 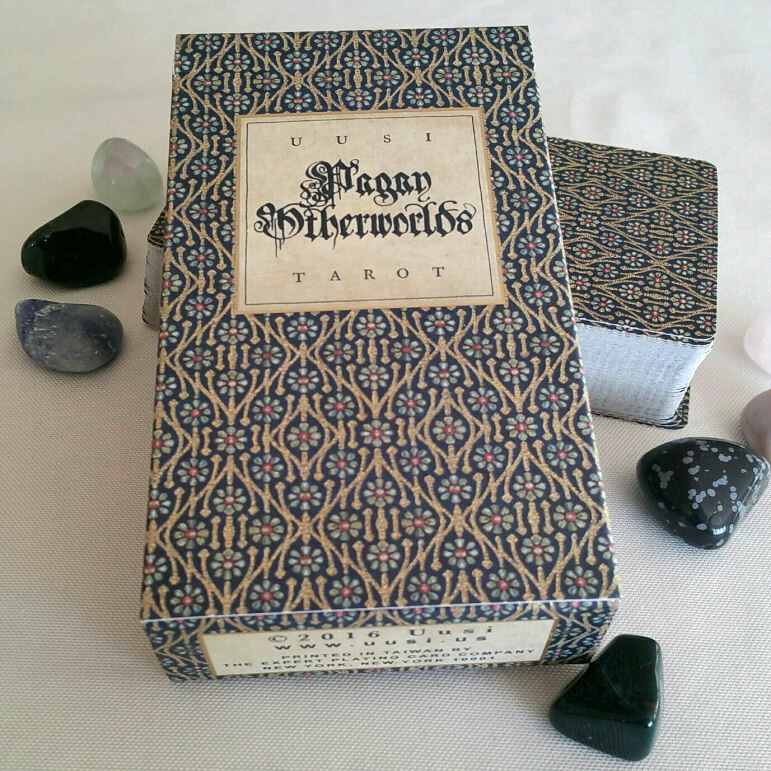 If you’re looking for a Victorian art inspired deck that makes reference to Western pagan iconography that works at the intersection of the Tarot de Marseille and the Rider-Waite-Smith, then look no further than Pagan Otherworlds. I love this deck! 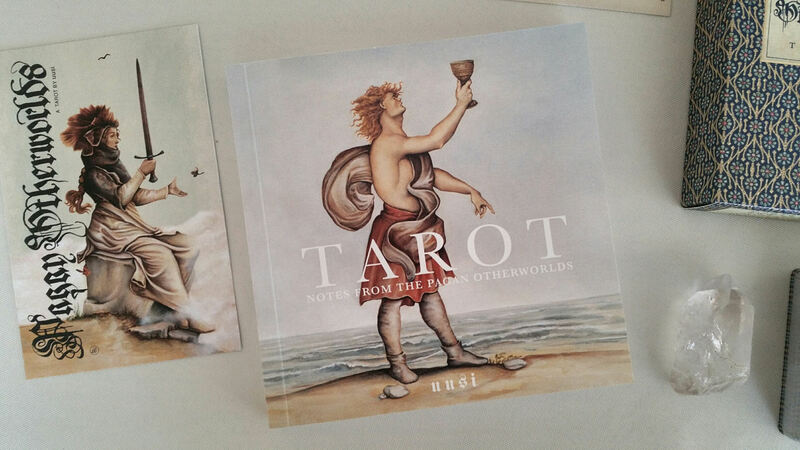 I’ve been using it for several months, and it’s my favorite Tarot deck to date. Thanks for the amazing review, the cards ARE beautiful are they not? Your presentation of the cards was awesome. My wife bought me the Azazoth Tarot after I oohed and ahed over it from your recent post, and this one is next on my wish list! They’re both gorgeous decks. I love this deck so much, it’s my newest favourite for sure. Great review, as always! Timing is tricky for me. How do you use the moon phase cards for that? P.S. Benebell, thank you so very much for going to the trouble of showing all the cards in your reviews! What a great review. 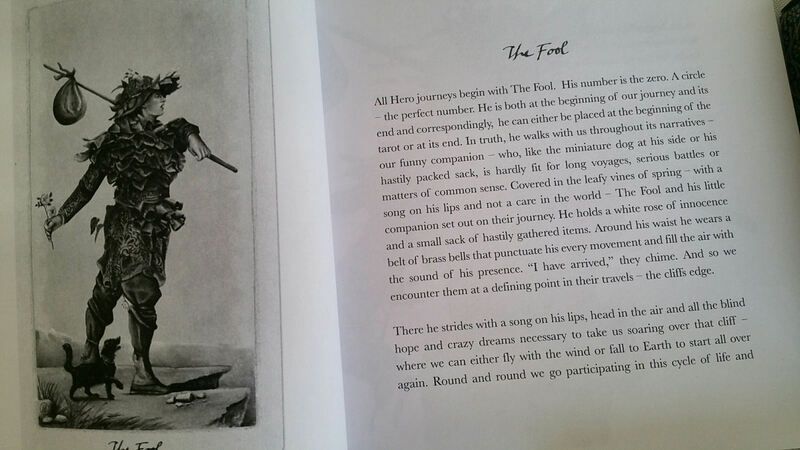 I love the pictures and explanations. Thank you.